An attacker randomly punched a woman who works for the New York City Council speaker in the face as she was walking on the sidewalk in Brooklyn, police and a city official familiar with the case say. Adam Kuperstein reports. An attacker randomly punched a woman who works for the New York City Council speaker in the face as she was walking on the sidewalk in Brooklyn, police and a city official familiar with the case say. 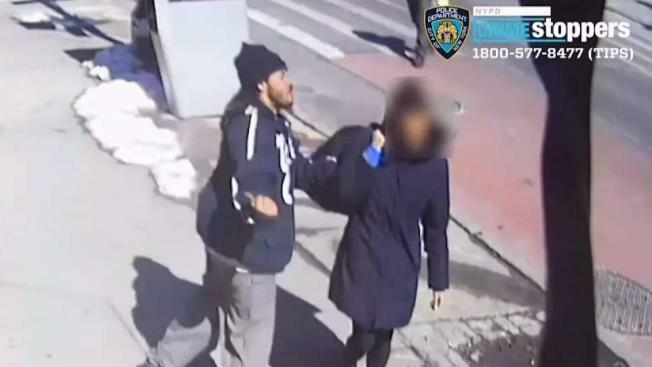 The man punched the 27-year-old woman on March 9 at around noon in the area of Nostrand Avenue and Crown Street in Crown Heights — and the attack was caught on surveillance video. The woman had just crossed the street and onto the sidewalk when the suspect, last seen wearing a Yale coat, slowly walked up to her and threw the violent haymaker, surveillance video released by the NYPD Wednesday night shows. The woman is seen on the video falling to the ground as the man casually walks away. Police said he fled the area, heading north on Nostrand Avenue. The woman drove herself to an area hospital to be treated for an injury to her head. The NYPD released surveillance footage of the suspect last seen wearing a Yale coat. A city official familiar with the case told News 4 the woman works for City Council Speaker Corey Johnson. A spokesperson for Johnson declined to comment on the incident. The NYPD released a second surveillance video of the suspect inside a nearby store moments after the onslaught. Witnesses are urged to call Crime Stoppers with tips that could help investigators arrest the attacker.